Railpictures.ca - Richard Hart Photo: IC 2460 & CN 5351 have just finished switching the pellet plant in downtown Armstrong and after putting their train back together will proceed to Kamloops with the SD40-2W running long hood forward. | Railpictures.ca – Canadian Railway Photography – photographie ferroviaire Canadienne. 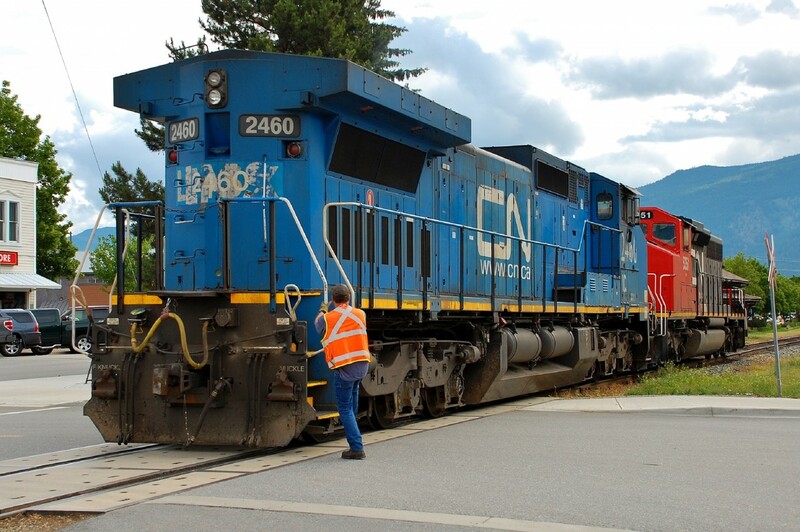 Caption: IC 2460 & CN 5351 have just finished switching the pellet plant in downtown Armstrong and after putting their train back together will proceed to Kamloops with the SD40-2W running long hood forward. Didn’t realize that I had posted an earlier shot of this lash-up..going senile I think! Interesting. 2460 might have cab issues, odours, or whatever. Bit of a ride home long hood leading.